The best tire shine is easy to apply and provides you with long lasting shine and protection for your tires and all your plastic, rubber and vinyl surfaces inside and outside of your car. Our pick, Car Guys, is a high quality product from a reputable company. If you love the look of brand new tires and want to keep that look regardless of the age of your vehicle, you want to purchase good quality tire shine. There are a lot of different tire shine products on the market. Determining which one is the best for your needs comes down to what you are looking for. With so many choices available it can quickly become overwhelming to try and sort through them all and find the one that you will like the best. The purpose of this buyer’s guide is to help you understand the different tire shine products out there and how to determine your needs so you purchase the right one. Using a good quality tire shine product will make your tires look shiny and brand new. This will also make your car look better overall. Most tire shine products, also called tire dressings, will last a few weeks and they are not overly complicated to use. It is an easy and affordable way to improve the look of your vehicle without a lot of fuss or upkeep. Are you looking for the perfect shine for your tires? Check out CarGuys Tire Shine Gel. You can get results that range from a deep black to a super high gloss shine. There is no mess that will get slung onto the sides of your car either. The special formula is created to bond with your tires to prevent run-off during higher speeds. Even though this product was created for your tires, you can use it on other surfaces as well including the dashboard, vinyl seats, rubber or plastic bumpers or any other plastic, rubber or vinyl item on your vehicle. The advanced, high quality formula gets deep into the surface to protect it from future drying and fading and will rejuvenate them so they look like new again. 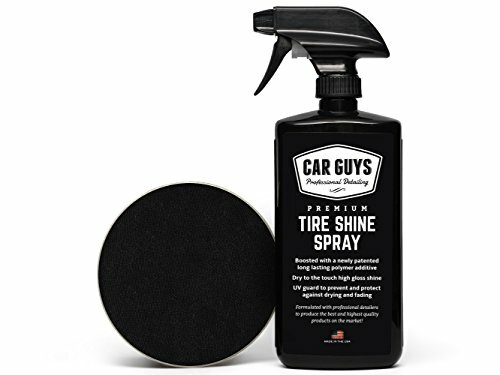 Another very popular feature of the CarGuys Tire Shine Gel is that it is non-toxic and can be used safely without worry of harsh, dangerous chemicals. It is made in the USA as well. This tire shine product is one of the best on the market and provides you with a long lasting formula that will last weeks instead of just days, that gives you a choice of shine from deep black to high gloss, and protection from harmful UV rays that are responsible for fading and drying. There is a tire shine gel applicator brush included for easy application that will allow you to get into all the grooves and bumps on the tire’s surface. This great product comes with a 100% guarantee whether you use it once or use the whole bottle. If you are not satisfied, they will refund your money. If you love having a clean vehicle that looks good as new, you’re going to love this tire shine gel. TriNova’s Tire Shine Spray will give your tires an attractive, shiny, dark look that will improve the look of your vehicle. You won’t have to drive around on faded, dusty tires anymore once you start using this product. In addition to making your tires look brand new, Tire Shine by Trinova will also protect them from signs of aging including cracking, fading, and yellowing. Outside elements can quickly ruin the look of your vehicle and damage tires. Using Trinova’s Tire Shine will eliminate worry over water spots and salt damage that can make your tires look dirty and old. Another benefit to Tire Shine Spray is that you can choose the level of shine you want. If you like high shine, leave the spray on longer. The longer you leave it on the more shine you will produce. Some of the shine sprays on the market don’t last very long but you won’t have that problem with TriNova Tire Shine Spray. Once you apply it, it will last longer than many other products and will not have to be reapplied several times a week to have that glossy, black shine that you are after. When you use Tire Shine Spray by TriNova you can expect protection against aging and deterioration, a dark, slick finish, long lasting gloss and resistance against dirt and grime. 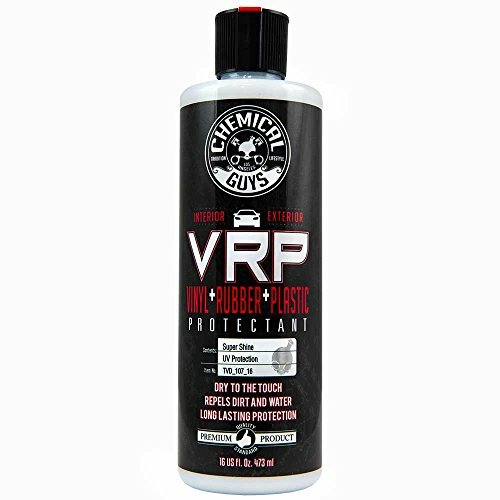 VRP super shine is a water-based tire dressing that works great not only on tires but on vinyl, rubber, leather, and plastic as well. It is dry-to-the-touch and can be used on the exterior and interior of your vehicle safely. Using V.R.P super shine will create a shield on your tires that will repel dirt and water so your tires look good as new. This product also protects the tires from UV damage. Your tires will resist fading, drying, and cracking while providing plenty of shine. There will not be a greasy or oily feel and it can be applied as often as you like without worry of discoloration or unsightly clouding. This tire shine is easy to use and produces a deep black look that will be shiny and new looking. Perfect for restoring the look of your tires or anything else you want to use it on. Many car enthusiasts that purchase this product also use it on steering wheels, dashboards, vinyl seats, door panels and much more. You can easily make this tire shine product a part of your car washing routine. It will keep your tires and other surfaces looking shiny and like new for weeks and not just days. This water-based tire shine will nourish and protect everything you use it on and won’t run, smear or get all over your paint job. The condition of your tires plays a significant role in how the rest of your vehicle looks. Cars or trucks that have sticky, dull, faded tires tend to look older and run down even if they are not. Tires can get dirty really fast since they are in contact with dust, grease, oil and road tar every time you take them out on the road. In addition, rubber degrades over time even if the vehicle isn’t driven every day. Having shiny, clean tires can be a big job if you don’t know what products to use. Finding the right, high quality tire shine products can make a big difference in the condition, longevity and appearance of your tires as well as improve the look of your car or truck overall. The three tire shine products we have featured above are all highly reputable, quality tire shine products that go above and beyond in what they deliver. Any one of them would be an excellent choice for getting your tires in great, off-the-showroom-floor condition. A benefit to all of these products we have reviewed is that they can be used on any vinyl, rubber or plastic on your vehicle. To learn more about tire shine products, read the buyer’s guide below. The information provided in this guide will educate you on the differences between the different types of tire shine products and help you sort through all the choices so you can make an informed decision you will be happy with for a long time to come. There are a few things you want to consider when you are looking for the right tire shine for your needs. We have listed these considerations below. Easy Application – One of the most important factors you want to look at when considering a tire shine product is how easy it is to apply. If the product is great but application is difficult and messy, most car enthusiasts will pass over it. The best option tends to be a tire shine spray so you can easily spray it on. Leave it for as long as you want and then easily wipe it off. Reliable – No one wants to purchase a product that doesn’t work. When looking at different tire shine products look for a product that has an iron-clad guarantee and a strong formula that lasts longer than a couple of days. Shine – Most car enthusiasts use tire shine products because they want their tires to shine like they did off the showroom floor. Look for a tire shine product that allows for a choice of shine levels. The different levels are achieved by how long the product is allowed to sit on the tires before you wipe it off. In general, the longer you leave it on, the shiner the tires will be. There are two types of tire shine products available on the market: water-based and silicone based. We have listed both types below along with some information about each type so you can decide which formula you want to use for your vehicles. Water-based – water-based tire shine can be washed with water. Because it is water based you may find that it goes away faster due to being exposed to the elements, especially rainy, wet conditions. Water based tire shines are safer for your tires and since it is easy to remove, you can clean off the old tire shine easily before applying a new coat. Water based tire shine is usually milky in color but this is not always going to be true so be sure to read the description and label to be certain. The shine from a water-based formula will not be a shiny or glossy as a silicone-based tire shine. You can re-apply it as often as you want and it is almost always bio-degradable. Other features of water-based tire shine are that it is not greasy or oily and they contain UV blocking agents to protect the tires from UV damage. This is a good choice if you are looking for long term care for your tires. Silicone-based – Silicone-based tire shine lasts a lot longer than water-based versions. If you want a product that lasts a long time and doesn’t require multiple applications each week, you will be happier with a silicone based tire shine product. Silicone-based tire shine has pros and cons like any other product. If you are aware of what they are you can be prepared to handle them. One of the drawbacks to silicone based tire shine is that it is hard to remove. This is good if you want long lasting shine that you don’t have to reapply often to achieve. It will also last through several rain storms and washes. The oils in the silicone based tire shine provide a shield that will prevent dirt and moisture from coming into contact with the tire. A couple of things to keep in mind when considering a silicone based tire shine is that over time they can harm your tires due to the petroleum solvents that are used to produce the product. You will get a glossy shine that is hard to beat but you will need to use multiple layers to achieve the level of shine you want. These multiple layers can collect dirt as you drive and give the tire a brown look that will look aged. Silicone-based tire shine is usually used for show cars that will not be driven so the chances of that brown look appearing is very slim since the tires are not in contact with the road to collect grime, dirt, grease and oils. There are several things you want to keep in mind as you are researching the different tire shine products on the market. We have provided these considerations for you below so you will know what to look for when shopping around. Great application = Great shine – Many tire shine products have applicators that come with the tire shine itself. The applicator you use and the ease of application will determine how well it works and how good of a shine you achieve. Look for easy-to-apply products, good quality applicators and check out those customer comments to see what consumers have to say who have already purchased the tire shine and have used it on their vehicles. Hard Applicators for Rubber – One of the reasons a manufacturer provides an applicator with the product is because they already know what type of applicator would work the best and get the best results from their products. If you are using tire shine for your rubber tires, be certain to get a hard brush applicator for the best results and read those instructions carefully. Microfiber towels work the best – When you are purchasing a tire shine, don’t forget to make sure that you have the right kind of rags to wipe it off. Microfiber towels work the best to wipe off the tire shine without leaving it in uneven deposits on your tires. Microfiber towels can be purchased separately and are great for this type of thing. Remember that water-based products can be washed out of towels but it is unlikely you will get your microfiber towels clean when using silicone based tire shine. All car enthusiasts love it when their cars and trucks look brand new. Even if they are now show cars, you want your vehicle to look as nice as possible. Tires are a very visible part of your vehicle and faded, dusty ones can ruin the look of your car or truck quickly. For this reason, many car owners use tire shine which is a product that brings back the shine of your tires and makes them look good as new again, tire shine will also protect your tires and the surfaces of your vehicle that you choose to use it on. We have reviewed three top rated tire shine products to educate you on the types of tire shine that is available as well as to help you understand how to choose the right one, how to choose between silicone or water-based and how to take care of the car or truck after you purchase tire shine. The information we have provided in this guide is designed to help you sort through all the choices effortlessly and make an informed decision you will be pleased with. When you take a look at your tires after you apply it for the first time, you will be amazed.